Our favorite diving trip! We only operate custom dive boats. The modern, state-of-the-art 46' Newton Diving Vessel is the newest, fastest dive boat on the island. Our boat has fresh water showers, rest room facilities, large dive platforms and ladders, ample storage space for dive gear and photo tables for photo and video equipment. Every morning, we head out for 2 tanks of diving on the Vandenberg. The USNS Hoyt S. Vandenberg is a 520 foot U.S. military Missile-Tracking ship that was decommissioned and sank in May of 2009 to make the largest shipwreck in the lower Florida Keys. She sits in 140 feet of water and towers up to about 40 foot from the ocean's surface. We take divers of all levels, aged 15 and up, to this dive location. This is an advanced dive, however, all divers are welcome to make the trip as long as guides are set up for anyone lower than advanced level. It is a sight you won't want to miss out on!! What are the requirements to participate in this dive? This dive requires an open water certification or higher. What is the guide fee? The guide fee allows newer divers that aren't advance certified to experience a deep wreck dive. Each diver within the same party should pay the guide fee (if even just 1 is needed) in order to dive together in the same group. Otherwise AOW or higher divers will be paired up with another AOW or higher diver. Can you pick us up from our cruise ship or hotel? Unfortunately pick up is not provided on this activity. Can I use/bring my own scuba diving equipment? Yes. Many people feel more comfortable using equipment they are familiar with and are best suited towards their body type. While we do everything to ensure our divers are using the safest, most reliable gear we do allow our divers to use their own dive gear. Can my non-diving partner come on the dive? Yes. While your partner will not be able to participate in the dive itself they can come along as a rider and enjoy the trip with you. Yes. There is a restroom or "Marine Head" for use on the boat. With all the media hype it's understandable why people offten ask this question but the truth is that unprovoked shark attacks are very, very rare and attacks on scuba divers are even more rare. 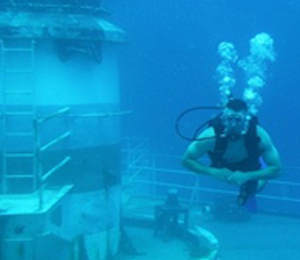 Our staff, divers and dive masters are all trained in making sure your dive is safe and enjoyable. You are responsible to make sure you're medically qualified to participate in this activity. No refunds will be given to those deemed medically unqualified. This is for your safety. Please note: We highly recommend having a wetsuit for the AM dive, especially in the winter months. Wet suits are available for rent from us for $10 per person during check in. Please note: Dive computers are required for this dive and are NOT included in the Full Equipment price. Please bring your own dive computer. If you do not have one, you can also rent one from us for an additional $15, during check in. Nitrox Can be added by request, and is not always available. Each tank is an additional $18. Max Depth Allowed - 100 feet, no exceptions. Special Requests: Occasionally we get requests to make the second tank of this dive a reef dive. This is very seldom, but is known to happen from time to time. Please understand there is a small chance we'll have a reef dive for tank #2. I have been to the Bahamas many times, but Morning Two Tank Dive is one of my favorite trips! It includes everything that everyone should do here. As a Bahamas veteran, I can say only the best about this experience!